A hero has to do what a hero has to do. “Final Crisis” is a polarizing tale to put it quite mildly. Following in the footsteps of DC Comics’ other crises (events such as “Crisis on Infinite Earths”, “Infinite Crisis”, “Identity Crisis”, and possibly even “Zero Hour”), this opus written by Grant Morrison is in a crisis “class” all its own. Like the previous crises, it expects the reader to have some knowledge of the DC Universe. However, it can be enjoyed thoroughly without causing too much confusion. “Final Crisis” can also bring the reader great joy and enlightenment because it expresses the power of storytelling and superheroes. Certain details and characters may be unknown to a specific reader, yet additional fun is promised if one delves into the history of the DC Universe through the Internet, other books, and (most importantly) interaction with one another. Like all great books, it fosters debate and discussion. Despite and because of its intensity, it is a story that has great meaning and deserves a place among the seminal stories in the comic book canon. Many have found this book to be a baffling chore to slog through. It is far from boring and is a fascinating read from beginning to end. By placing the “Superman Beyond” two-part miniseries, a one-shot, and two issues of “Batman” that are pertinent to the story in the middle of the “crisis”, greater understanding, depth, and cohesion is felt through the central 7-part miniseries and the very end of Morrison’s epic. The entire structure of “Final Crisis” is intricately built, yet straightforward. The themes may be intense and the concepts may be bewildering at first but, with careful reading, one can see how the nonlinear way the story is told only adds to its brilliance. A LOT happens over the course of this tale and Morrison weaves subplots through the main plot, requiring the reader to enjoy this ride straight through in one sitting (or a few) in order to absorb every morsel of this feast. It does require some work, but the results are well worth it. Like many of Morrison’s works within his oeuvre, it is a piece of art that deserves to be studied and revisited for continuous inspiration. Despite what others may say, there is a plot coursing through this book. A query from the first issue sets up the basic premise quite succinctly: “What happens in a world where good has lost its perpetual struggle against evil?” With his Anti-Life Equation (“the E = mc2 of despair” according to Morrison), Darkseid has won the war in Heaven. Evil has prevailed after the war between the New Gods. With Darkseid waiting for the right moment to rule the “worlds”, his minions solicit the aid of Earth’s villains. As is wont with Morrison’s writing, not all is Sturm und Drang. Humor is a component in his stew of genius. At one point, while being wooed by the nefarious Libra, Lex Luthor rejects giving up power over the Secret Society of Super-Villains. “My creed is Luthor,” he says defiantly and authoritatively. Morrison also gives many of the heroes moments to shine because, of course, they will prevail in the end. The Flash “family”, Batman, and Superman are just some of the heroes that have especially powerful and character-defining moments that prove their greatness. An epic cast was needed for an epic story and Morrison and company have not disappointed. With multiple worlds within a multiverse, Morrison’s heady ideas course through the veins of this book. Plot, although important, is not as vital to this book as the various themes that are its lifeblood. “Final Crisis” can almost be mined for as much meaning as there are characters in the book. One of the central themes questions the definition of a hero. Not only must a true hero sacrifice for others, but they sometimes have to do things that are uncomfortable for them. Batman makes the ultimate sacrifice with his life (which was reflected in his ongoing titles during this time). Superman, in a glorious moment reminiscent of Morrison’s “All-Star Superman”, risks his life for the betterment of the multiverse. The villains even understand the superiority of the heroes. 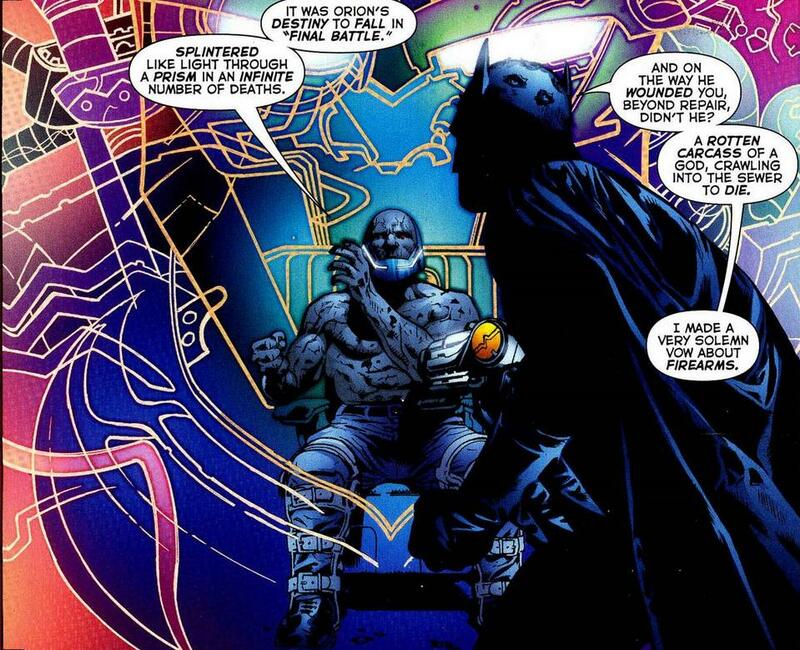 When Batman is broken down by Darkseid’s minions, they want to steal his “superior physical prowess, strategic acumen, and courage [that] make him unique.” The heroes of the DC Universe, and particularly Batman, have traits that even the bad guys respect and covet. One aspect of the story that is given short shrift is the pure fun of Morrison’s story. 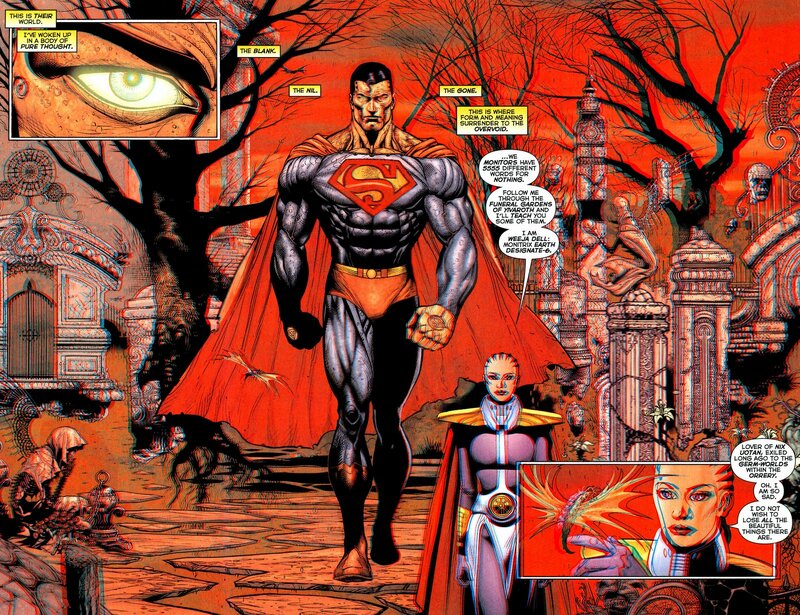 During battle in the final issue, Captain Marvel and the Question (a “global peace agent”) were sent to help the multiverse and, “recruit the Supermen of the multiverse on a life-or-death mission of cosmic proportions!” This juxtaposition of the serious and the outrageous in “Final Crisis” is appropriate and transforms the characters’ journeys into something even more profound and beautiful because of Morrison and the artists’ efforts in making this a layered and entertaining yarn. An operatic battle between good and evil that involves time travel and multiple universes can’t help but beg for a little levity. Heroes are plentiful in “Final Crisis” and the threat must be as larger than life as them. Every hero needs a villain, and Darkseid is one of the greatest. Created by Jack Kirby, Morrison has stamped his indelible mark on the character. Darkseid’s Anti-Life Equation is described as, “loneliness + alienation + fear + despair + self-worth ÷ mockery ÷ condemnation ÷ misunderstanding.” This equation equals one thing: chaos. That chaos is expressed in the way the story is told and the story itself. Every element of Darkseid’s equation is the antithesis of a hero. His minions repeat mantras such as “Give in” and “Self = Darkseid”. Libra, who works for Darkseid, attempts to coax every villain to “give in” to Darkseid and even possesses those who are the most innocent and vulnerable: children. 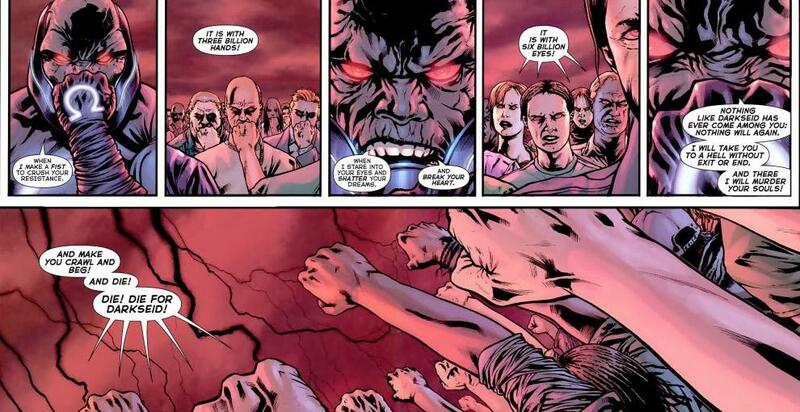 Darkseid’s sole purpose is to consume the soul of every living being and erase free will and individuality. He is the embodiment of the perfect villain: hate and chaos personified. 3-D glasses really make this scene pop! J.G. Jones began as artist on this book and eventually needed assistance from Doug Mahnke and other artists. Jones has apologized in the past for not keeping up with the book’s schedule, yet Mahnke and company were up to the task of retaining the tale’s epic scope. The various inkers, colorists, and letterers bring a uniformity that is not jarring. The level of care and craft put into the art is evident throughout every issue of the miniseries, the one-shot, the “Batman” issues, and the 3-D two-part miniseries interlude called “Superman Beyond”. And yes, the glasses supplied with the Absolute edition make Doug Mahnke’s (and the group of inkers’) art pop off the page. It’s a fun effect for the brilliant and mind-bending Superman story that is one of the best Superman stories ever told. It expresses his optimism and self-sacrifice so succinctly and, though not in the same league as “All-Star Superman”, is pure fun amid the gloom and doom. Great review Keith! I couldn’t agree more (and I certainly couldn’t have said it better). I think promoting the power of hope is a theme that Morrison showcased brilliantly, albeit a little confusing at times here in this story. Thank you, Brian! The theme of hope seems to be prevalent in a lot of his works. Hi, Keith. I recently read this too. For all the themes and ideas Morrison piles in here, sometimes not quite successfully, I was pleasantly surprised to find myself so moved emotionally by the ending of Final Crisis. I also felt the same way with The Return of Bruce Wayne, which is related to this. I never figured early Morrison to be so emotionally riveting but he’s certainly picked up the quality in the past decade or so. On to The Multiversity (which is actually a more accessible read than Final Crisis)! Yes, I agree with you that Final Crisis, The Return of Bruce Wayne, and other works by Morrison are very moving. And yes, The Multiversity is more accessible than Final Crisis! I think it was a stunning first issue! Did you like it? I loved it and can’t wait to read the next. So much bang for buck, that issue.